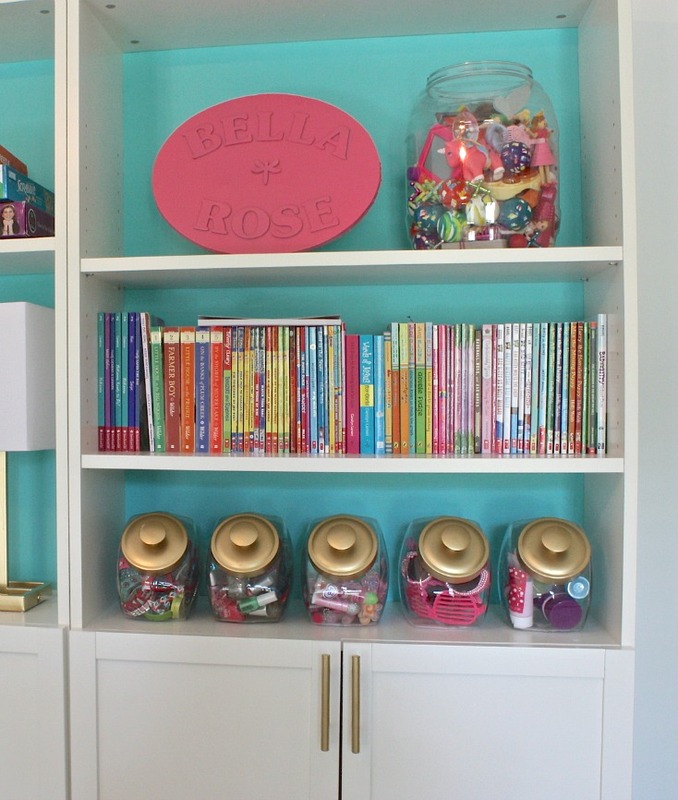 Over the years, I have shared a lot of tips and tricks here on the blog for organizing children’s spaces but I have never dedicated a whole post with all the little tricks together. Today, I wanted to pull everything together to show you some shortcuts and easy tricks that can make a big impact in keeping your kiddos organized. The one thing I have learned (the hard way) over the years and talk about in great lengths in my book Organizing Your Life (Amazon Affiliate)the importance of giving everything a home in children’s spaces. If all the clutter has a home, even the youngest of kids can learn and help to keep their spaces a little more organized and tidy. Also, kids are not going to neatly put things away, so storage pieces like bins, baskets and toy boxes that they can toss things into will make all the difference! Whether your child is a toddler or older, take a look around their room and look for areas of wasted space. In my daughter’s room, I have incorporated storage pretty much everywhere that I can. 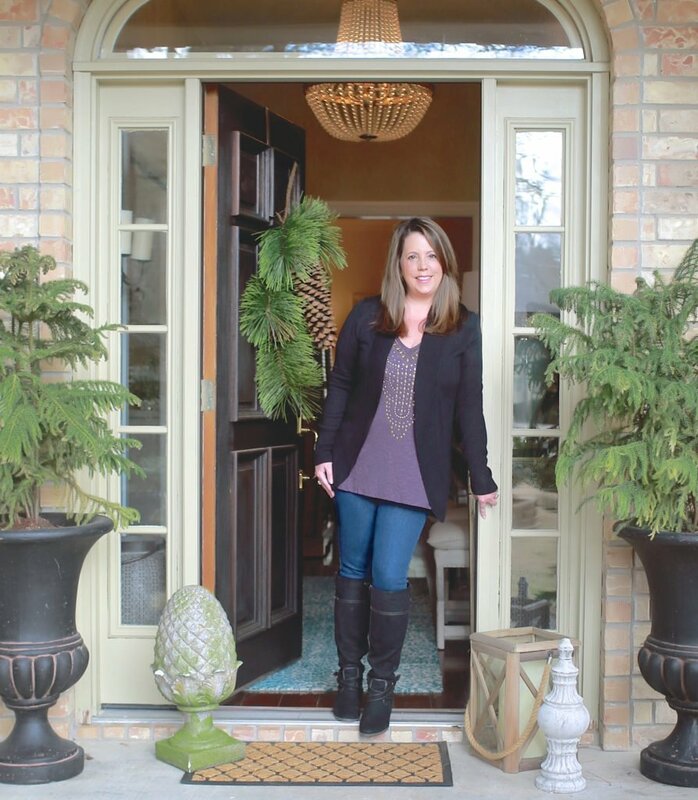 I started this process by choosing furniture pieces that are dual-purpose in that they create storage plus, these furniture pieces fit the space and especially maximize space. Another thing to thing about, as you buy furniture for toddler rooms, remember that time goes by quickly and pretty soon they will be pre-teens, with different needs. If you buy very basic but good furniture storage pieces, these pieces can last from toddler beyond. 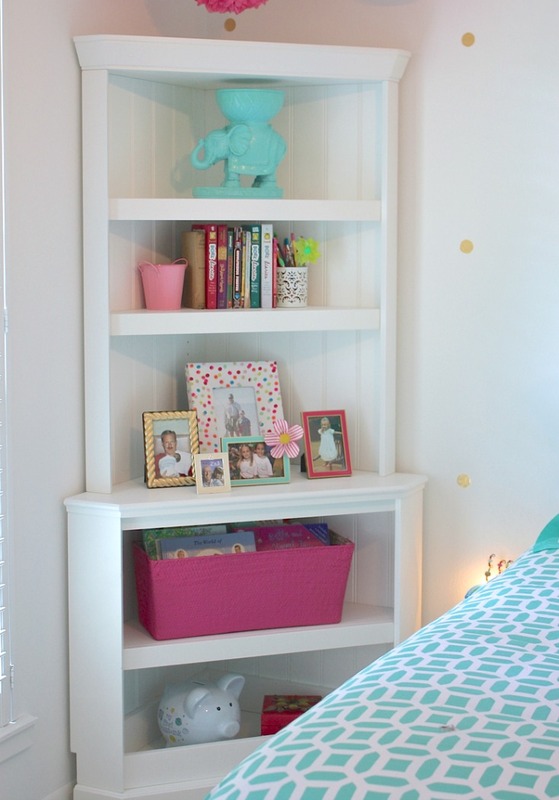 Narrow bookshelves that are bolted to the wall for security can add a lot of storage space. The bookshelves that we purchased are extra narrow to not intrude on her walking space. These are the Ikea Billy bookshelf series and I loved that the option of both open/closed shelving. 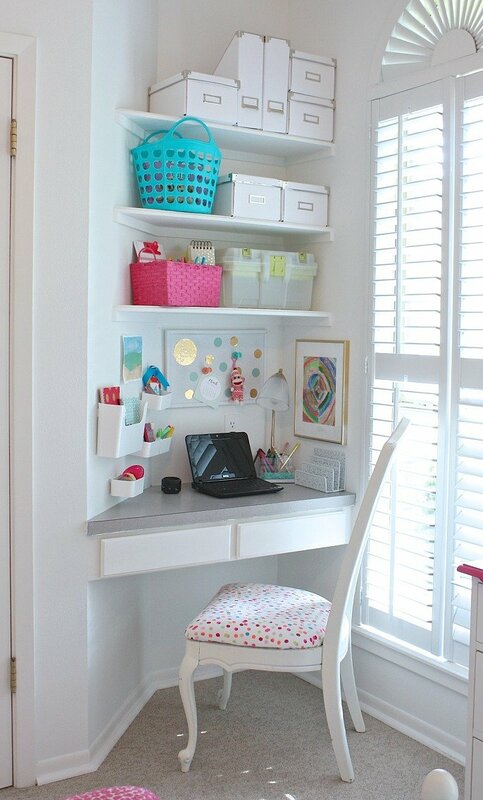 This is a great way to maximize wall space for storage as well. The best part is that they hold so much! I’ll share more in a moment on the pieces we used for storage inside of the bookshelves. In my opinion, toy boxes are one of the best possible storage furniture pieces that you can have in a child’s room because they are perfect for tossing for quick clean-up and they can hold so much. In my daughter’s case, she is now 13 and I simply updated her toddler toy box and reupholstered it to look like a beautiful grown-up bench. However, she still uses it for quick storage. 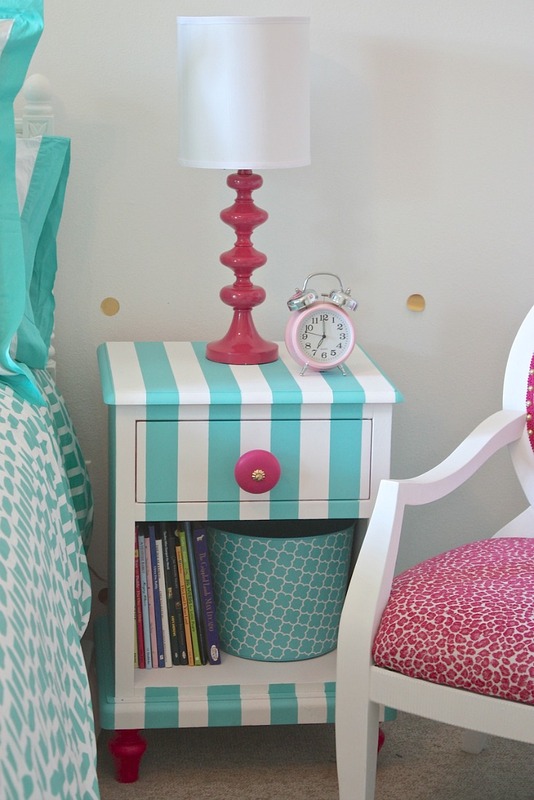 Now, even when she’s 17, this piece will look great in her room and will still give her additional storage. 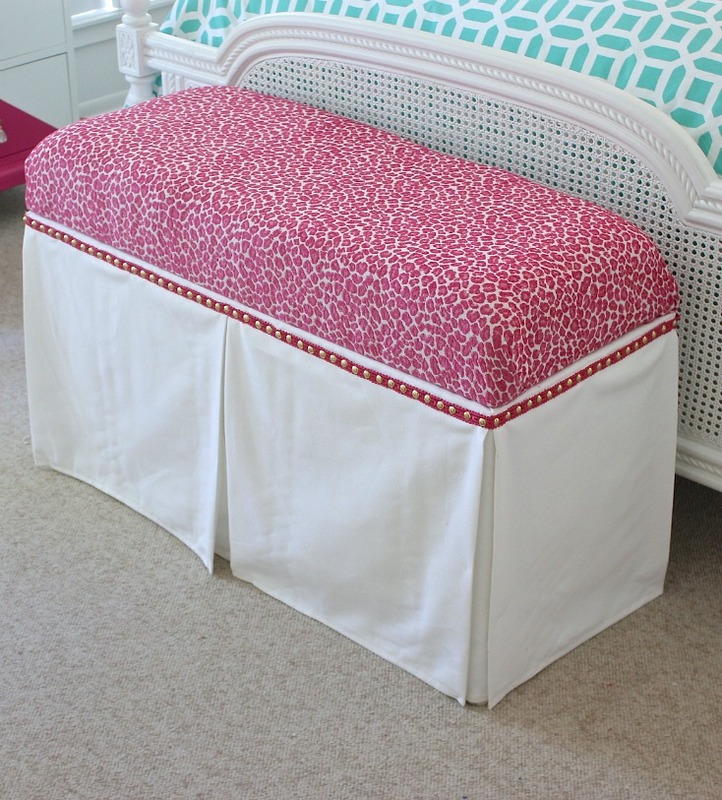 You can see our tutorial here for reupholstering old toy boxes by using this cool “faux panel” trick. 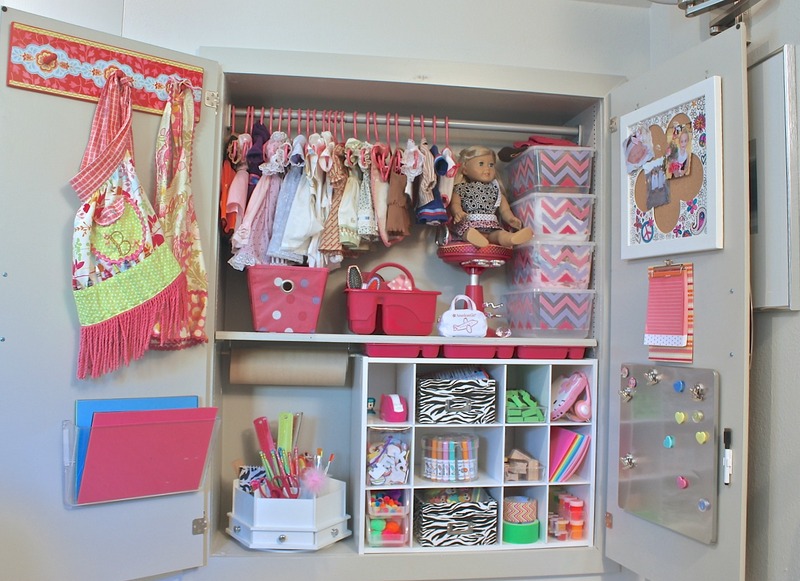 As you look around your child’s room for areas of wasted space, look for storage pieces to creatively fit those spaces. 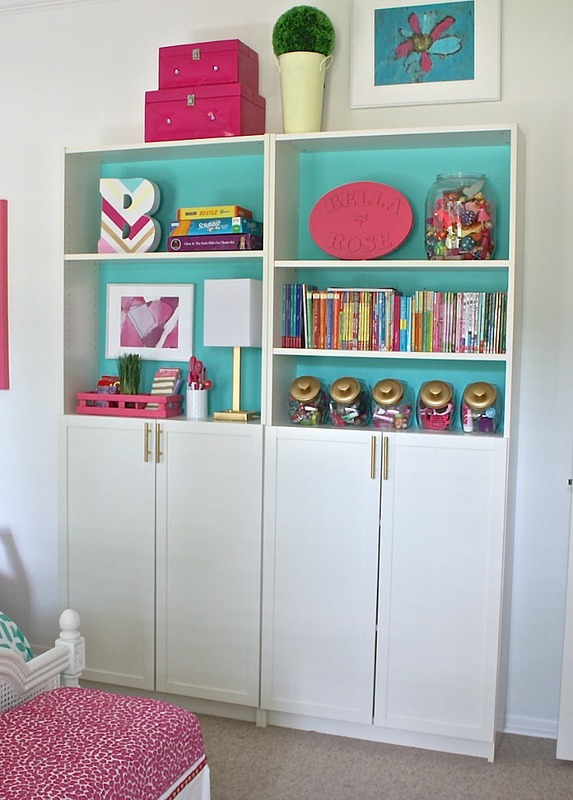 For instance, we had a corner area in my daughter’s room that was wasted and I found a corner shelving hutch that fit perfect and had plenty of storage. 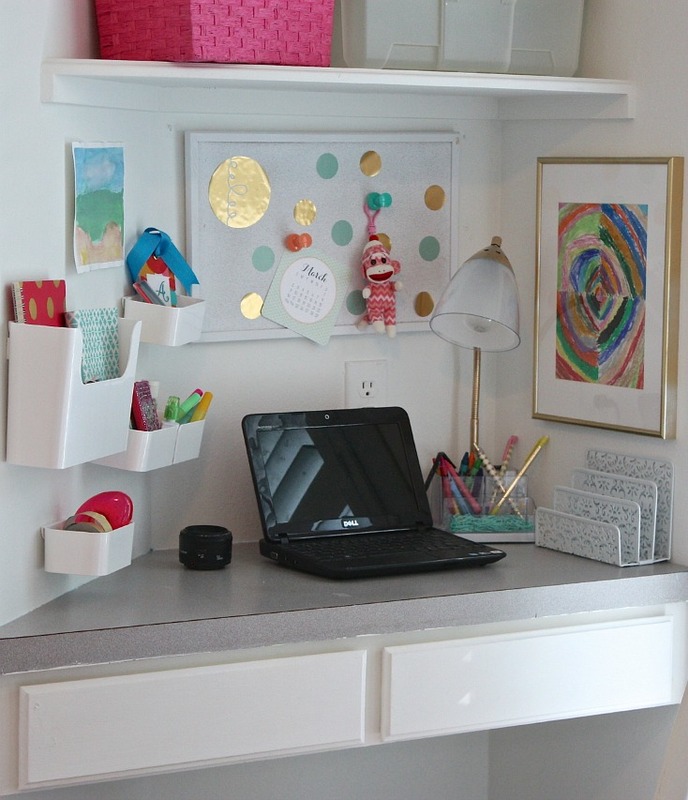 If your child has a built-in desk or a desk area in front of a wall, create additional storage by adding shelves and wall storage pockets to keep the top of desk clutter free. By the way, baskets, photo boxes and even tool boxes are great pieces to help with organizing the little stuff around desks. Even a simple nightstand can add lots of storage, especially if you find one with both a drawer and closed/open storage. I slipped in a large metal bin for my daughter to slide out and toss little stuff. 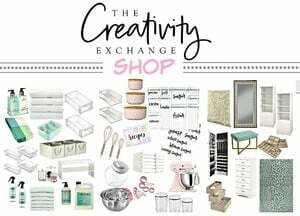 All that kid little stuff is one of the biggest challenges and I have lots of quick tricks for storing (or tossing) all that clutter! I’m a huge fan of cube storage pieces and use them everywhere in our home. In my office, closets, bathroom cabinets, etc. 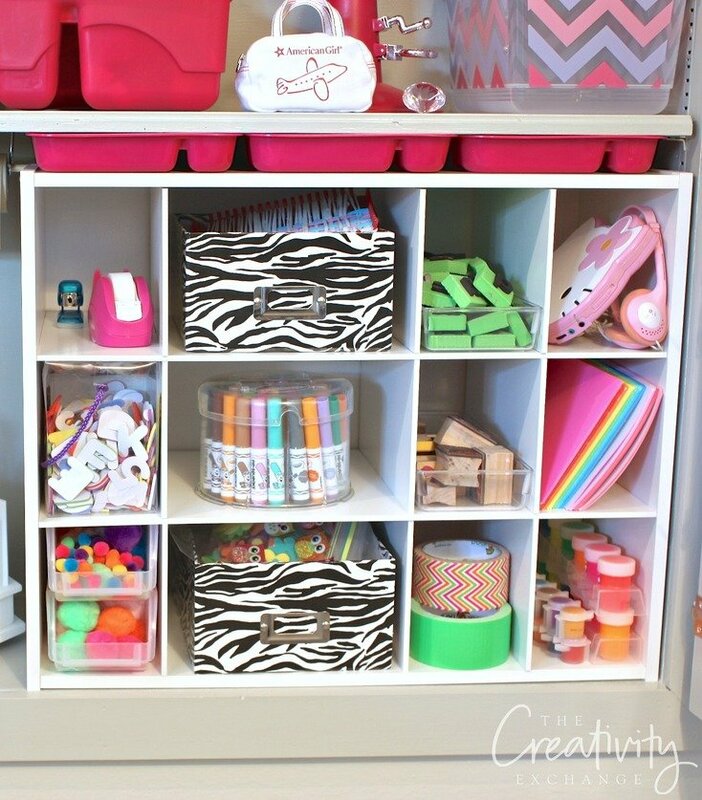 Cube storage pieces are awesome for storing kid stuff, especially in the toy room slipped into cabinets or closets. 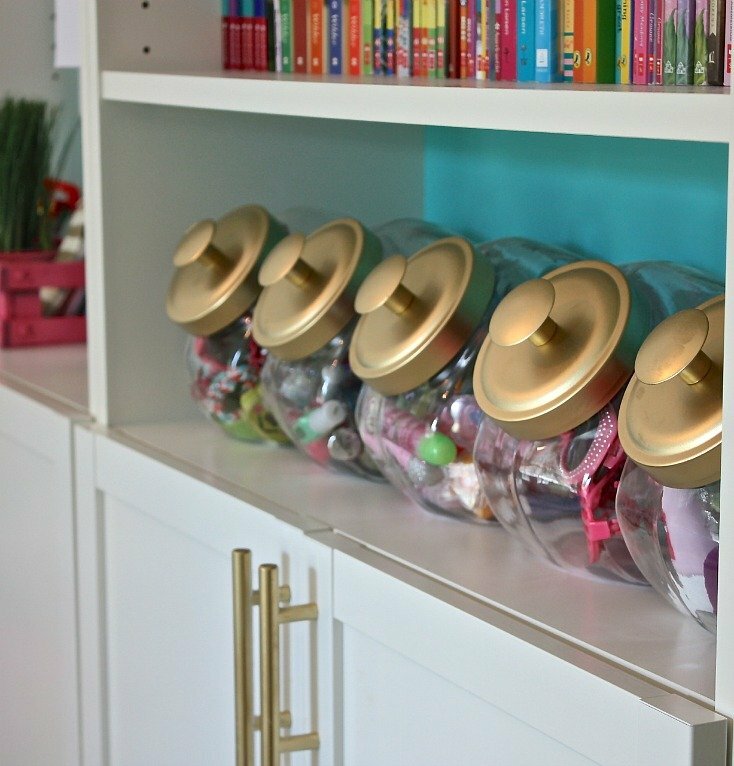 Candy penny jars are another great vessel to use for kid storage and they are available in glass or plastic. In my daughter’s room, we use them for organizing fingernail polishes, jewelry, lotions, etc.. These glass penny jars are available at Target here. 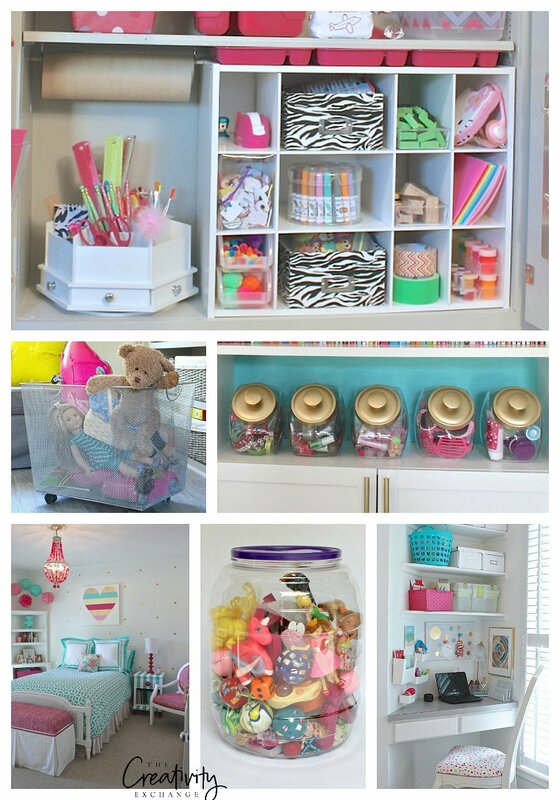 As I mentioned in the beginning, kids will help you keep their spaces organized if everything has a home. Also, they liked to toss! Heck, I like to toss. So for all that little stuff that doesn’t have a home (balls, games, stray crayons, toy cars, etc.., I recycle empty barrels of pretzels/cheese balls for an easy catch-all. These barrels are great to have throughout the house! In the play room, kids room and even garage because when you can just toss in the barrel but you can instantly spot stuff. Don’t forget about hidden spaces under beds. 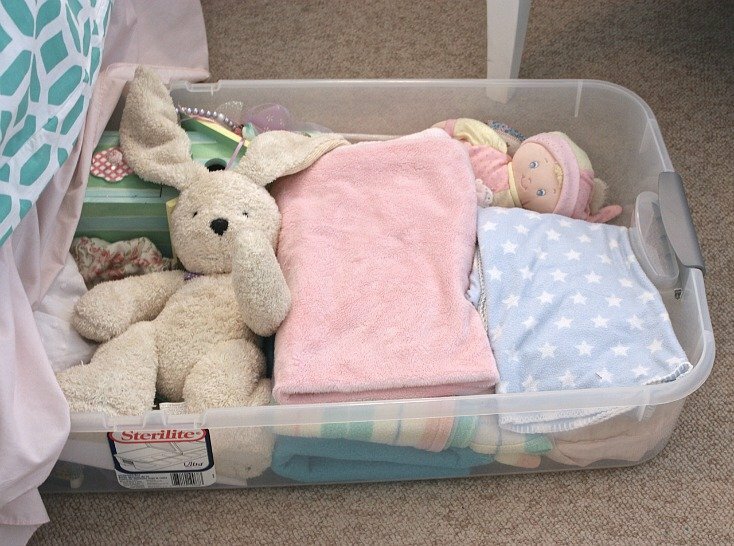 Use plastic storage bins designed for under bed storage for stuffed animals, books or pretty much anything! 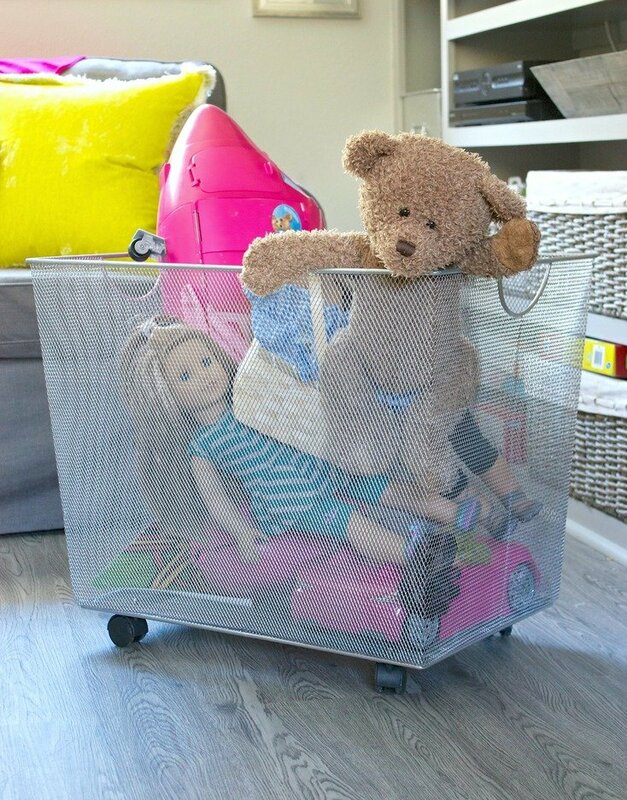 One last easy trick is to buy deep storage bins with wheels for the playroom or other kid spaces in your home. 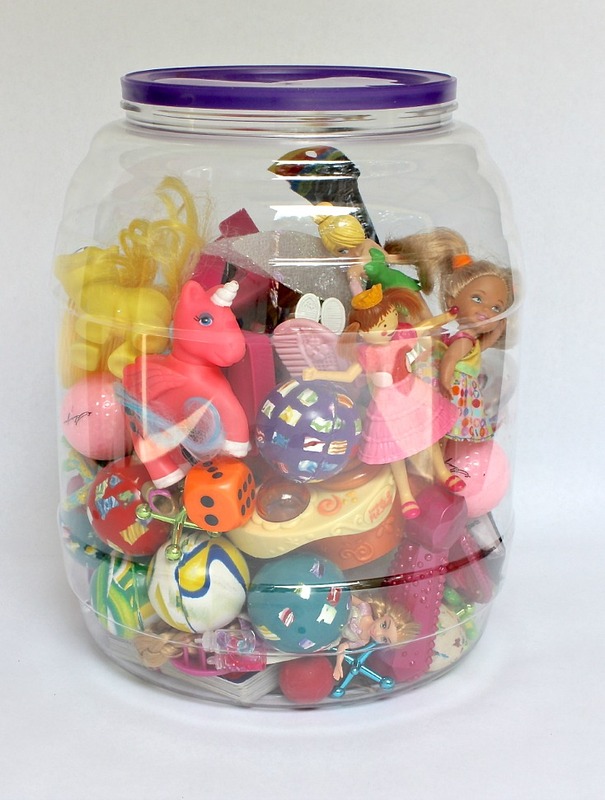 If you have toddlers, this is a great way for kids to toss toys in bin at clean up time and pull bin to where they want to play. It’s also easier on you! Bins with wheels are available pretty much everywhere in every material you can imagine! You can look through Amazon here to see a variety of options. I hope there is something here today that can help you with getting organized! Cyndy Aldred of The Creativity Exchange is a participant in the Amazon Services LLC Associates Program, an affiliate advertising program designed to provide a means for sites to earn advertising fees by advertising and linking to [insert the applicable site name amazon.com. Thank you for all these great tips! 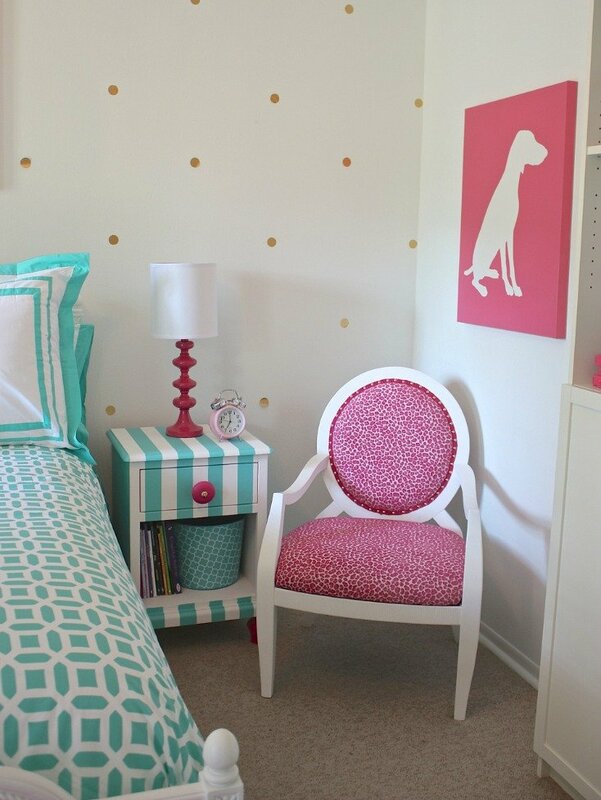 Your daughters room is beautiful! Love the colors.